This book is about a young boy called Chris with a vivid imagination. He dreams of flying to the moon in his own spaceship. However Chris often doesn’t sleep, he is afraid of the dark and imagines his bedroom is full of scary aliens. One exciting night he goes to a neighbour’s house to watch the first moon landings live on TV. Chris is amazed at how dark space is, the darkest dark ever, much darker than his bedroom and very, very beautiful. Chris is no longer afraid of the dark and he dreams of really becoming an astronaut. 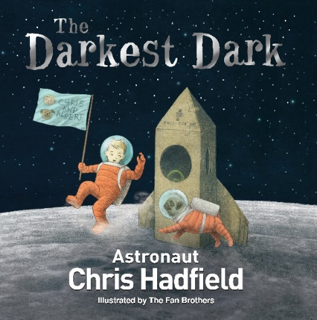 Set in 1969, this story about the wonders of Space, fears of the dark and dreams for the future is co-authored by the first Canadian astronaut Chris Hadfield and based on his childhood experiences. It includes information pages about Chris and photographs and is stunningly illustrated by the Fan Brothers. Guaranteed to inspire young astronauts of the future and all space enthusiasts. Before beginning to read the story to your child look at the cover and then the initial double page scene. Talk together about what might happen in the story. Read the story aloud allowing time to look closely at the detailed illustrations. There is lots to talk about and discuss in this story and it is worth sharing more than once. Share the information about Chris at the back of the book together and look at the photographs. When you read the story again see what you can spot in the illustrations, for example all the things in Chris’s bedroom including the number of aliens. Look closely at the picture of the first men on the moon and talk together about what children can see. What would they like to find out more about? Talk about Chris’s fear of the dark, have children ever felt like that? What helps to reassure them? Talk about the fact this book is based on a real person. Collect some large boxes and make a rocket together. Your child could play in the rocket imagining they are taking off for space. In a large space inside or outside do some moon walking with light bouncy steps. This is more fun if you do it together! If possible, look at the night sky together, how dark is it? Can you see anything in the night sky eg the moon, stars or any planets? Use black paints or crayons and paint a picture of the ‘darkest dark.’ Draw coloured pictures of the planets, stars or constellations like those illustrated in the book on separate paper. When the black night sky is dry cut out the moon, stars and planets and stick them on the background to make a darkest dark space picture. Make your own mini zig zag book about a real astronaut, Chris Hadfield, Tim Peake, Neil Armstrong or perhaps another. The links below may help you to find information.